EarCatch Ringtone Express is an advanced solution for making ringtones from any sound. It is very easy to customize unique ringtone for almost all mobile phones. You are enabled to clip any segment you want from your audio files. The visual audio editing is supplied to edit music easily.Create ringtones from audio files and audio CDs.Wide-range bitrates support & easy presets gives you best quality. EarCatch Ringtone Express can make ringtones from any sound. ...... Also, the well-configured presets and configuration parameters are provided to adjust output quality for amateur and professional demands. Create ringtones from audio files and audio CDs. - Input the audios from local folder with ease. - Load audio CD track easily. - Cut a piece song for any length of time. - Save the input audio file into MP3, WMA, WAV or OGG. Wide-range bitrates support & easy presets gives you best quality. - Parameter settings and quality presets are provided. - Output the ringtones of different qualities for various cellphones. - Create ringtones while maintaining the quality of source audio. 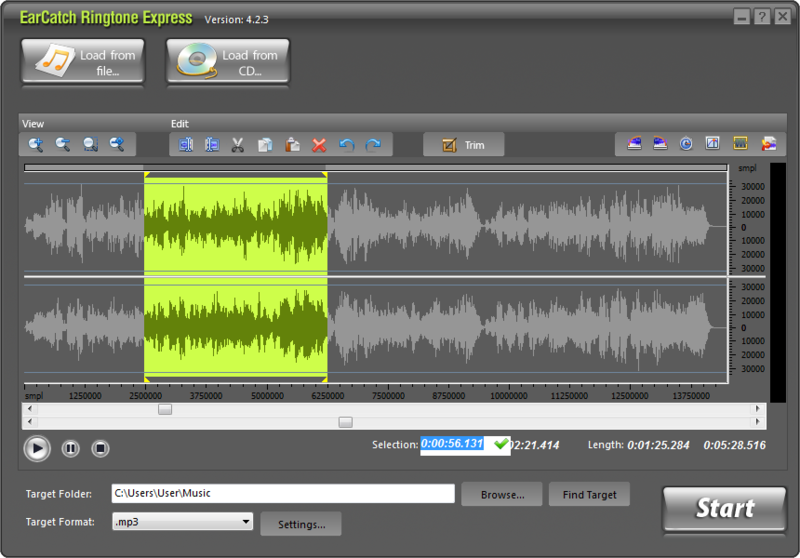 Visually edit audio files on the audio waveform. - Zoomable waveform for better view and more precise editing. - Mix the current file with another audio file. Qweas is providing links to EarCatch Ringtone Express 4.5.5 as a courtesy, and makes no representations regarding EarCatch Ringtone Express or any other applications or any information related thereto. Any questions, complaints or claims regarding this application EarCatch Ringtone Express 4.5.5 must be directed to the appropriate software vendor. You may click the publisher link of EarCatch Ringtone Express on the top of this page to get more details about the vendor.